Rep. Gabrielle Giffords was among as many as 12 people wounded in a shooting at a Tucson, Ariz., grocery store where she was holding a campaign event. ABC affiliate KGUN-TV in Tucson reported that as many as 12 people had been shot, including Giffords. A law enforcement source told KGUN that the shooter was in custody. Huffington Post had a piece in 2009 about the nuts getting out of control at Giffords' town hall meetings. Someone dropped a gun at one of them, read HERE. 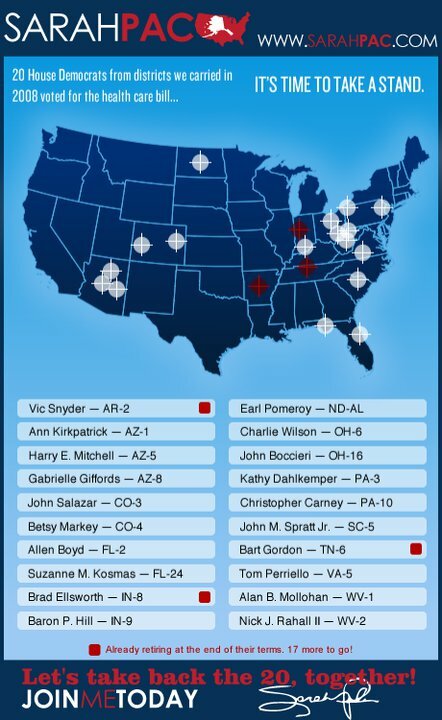 Giffords was listed fourth on Sarah Palin's campaign poster, with crosshairs over her. Early reports are bad. Pray for her and the other victims. or blame Alice Cooper for Columbine because he sang "school's been blown to pieces"
see where your kind of comment leads? Anon, the use of gun imagery in a political debate is inexcusably irresponsible. It inevitably leads to the kind of thing we saw today. The teabaggers and other ultraconservatives have been talking about armed revolution and Second Amendment remedies, and it makes a nut like this thinks he's a hero for what he's done. We have a lawful way that we elect our leaders and allow them to serve their terms. The government has been tolerant of sedition and treason and maybe they shouldn't be. It is fine for someone to oppose an elected official and their policies, but talking about shooting your political enemies results in what we saw today. Inevitably. did you know the Salvation Army calls donations to their mission "cartridges"? did you know the Bible calls children "arrows" in their parents' quiver? Anger at God is nothing new. In the Hebrew Bible, anger goes back at least as far as Abraham, who, according to Genesis 18:23, was angry at God for God's readiness to destroy the innocent people of Sodom along with those who were guilty. The notion of getting angry at God is the topic of a newly released study by Case Western Reserve University psychologist, Julie Exline. Among the most interesting findings in Exline's study are the place of anger at God in the lives of self-declared atheists. Self-declared atheists, according to the study, not only report getting angry at God, but report higher levels of anger than that experienced by believers. Why bother being angry at something which one doesn't believe even exists? Clearly, when you read the writings of some of the most vocal atheists of our time, it becomes clear that they don't disagree with the possibility of the existence of God so much as they hate the idea of God. Therefore, their need is not to rationalize God but to find peace with God. Those who enthusiastically supported the Nevada Republican Senatorial nominee who urged "Second Amendment remedies" if her side did not win might wish to reconsider their approach to politics. who were those people, David? One of your cronies, "Anonymous"
"The suspect Jared Loughner was described by a former classmate as a pot-smoking loner, and the Army said he tried to enlist in December 2008 but was rejected. Federal law enforcement officials were poring over versions of a MySpace page that included a mysterious "Goodbye friends" message published hours before the shooting and exhorted his friends to "Please don't be mad at me." "I know who's listening: Government Officials, and the People," Loughner wrote. "Nearly all the people, who don't know this accurate information of a new currency, aren't aware of mind control and brainwash methods. If I have my civil rights, then this message wouldn't have happen." In Loughner's middle-class neighborhood - about a five-minute drive from the scene - sheriff's deputies had the street blocked off. The neighborhood sits just off a bustling Tucson street and is lined with desert landscaping and palm trees. "Sometimes religion was brought up or drugs. He smoked pot, I don't know how regularly. And he wasn't too keen on religion, from what I could tell," Wiens said. Lynda Sorenson said she took a math class with Loughner last summer at Pima Community College's Northwest campus and told the Arizona Daily Star he was "obviously very disturbed." ''He disrupted class frequently with nonsensical outbursts," she said. In October 2007, Loughner was cited in Pima County for possession of drug paraphernalia, which was dismissed after he completed a diversion program, according to online records." The entire Republican Party and Tea Party Establishment, that supported Sharon Angle, who made the statement. Anon, I think the murderer will turn out to be schizophrenic, he is not politically motivated. His concerns are symbolic, bizarre, he is a person who has been trying to hold his world together and it finally disintegrated in a terrible way. The idea of shooting Gabby Giffords was in the air already, Sarah Palin published a map with crosshairs over her, other teabagger politicians had also been talking about armed insurrection, Second Amendment remedies, rising up against the government, others have threatened this Congresswoman and brought firearms to her events, and when this crazy kid's delusions reached a breaking point this was offered as a reasonable way to get the devil off his back. He could easily expect to be regarded as a hero for his act, instead of a pitiful insane person. It's an insult to both liberals and conservatives to try to brand him as a member of either group, and in the end you look even stupider than you usually do. He was a schizophrenic looking to resolve paradoxes that you and I cannot understand. Cast in an environment where guns are casually offered as a way to resolve arguments where nobody wants to admit being wrong, he took to guns. when Christine Ananpour pointed out that there was no evidence or indication that the shooter had ever thought about Sarah Palin or the Tea Party, he dissembled and said, "well, this is still a crossroads for the divisive rhetoric in this country"
because you can't get traction any other way than false accusations? by Abraham Lincoln. Please, read this...this is a problem that will always be with us. What matters is what each of us does. I have tried to be careful in what I say when speaking in the public arena, because like the late Richard Weaver I too realize that Ideas have Consequences. Still I find it odd, even a little disorienting, that a few short years ago I could see everywhere I went "Dissent = Patriotism"...is that no longer true?